In my previous post I challenged you to think about how you were raised and what lasting memories you want to leave with your children when it comes to finances. Now it's time to think about how we convey those messages to our children. Below are 10 important lessons that I plan on focusing on with my kids. Talk to your kids - I think finances are one of those things that fits with religion and politics that people are afraid to talk about. There was a line that grabbed my attention in this articlethis article on Dave's website "...if you don't teach your kids how to handle money, someone else will." It really drove home how important money really is (yes, it is as important as s-e-x talks), so why aren't we having money talks? There is certainly plenty to talk about. Teach them to save - This sounds like a no-brainer, but how many of us grew up without really understanding the importance of this. Obviously with the amount of consumer debt in our society and America's savings rate quickly shrinking, it was more than just a few of us. I think it's not enough to teach kids to save, but we need to help them understand why and exactly what impact that will have on their future. Teach them to spend - It may sound silly to say this. Who wouldn't want to spend? Right?! But a lot of kids (people of all ages, really) get so focused on saving that they actually forget to spend. Dave really stresses the need to be well-rounded financially. Kids need to spend so they see the value (literally and figuratively) of money and see the rewards. It's teaching them to spend wisely that is the real key. Teach them to give - I've heard a lot of examples of parents teaching them the first two parts of this equation, but the third leg of the stool often gets forgotten. Kids need to give, and give responsibly. This helps build important values that will have a significant impact on their future. This is part of the lesson that keeps them from abusing your hard work down the road. When kids give money they earn, they learn the power of that dollar and it means a lot more. Show them the importance of work - Most of the time when we talk about kids and money the topic is allowances. Dave says this is the wrong word to use. It's not a welfare approach that we should be taking. You don't get money simply because you are breathing. He says we should call it commissions. It makes sense when you think about it. If you work you get paid. If you don't work, you don't get paid. I'll talk about this a lot more in a future post. Start early - A lot of times we under estimate the ability of our kids to understand concepts. 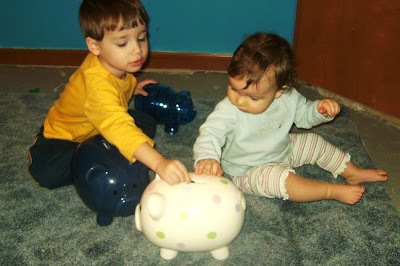 A lot of sources start giving guidelines on money around the age of 3. Before I started really looking in to this, 3 seemed incredibly young. But now that I have a 4 year old in the household, it's clear that they are little magnets at this age and it's the perfect time to start. Obviously how much they understand at this age is different than what a 10 year old will understand, but don't miss out on early teachable lesson. Just make them age appropriate. I'll talk about this is a future post too. Break down the barriers - Money can be scary. As adults, many of us are still afraid of money. I think the earlier you actually start talking to your kids, the less scary money will be. Every household will be different in how much they share with their kids. Tim and I plan on not just talking about general money concepts with kids, we also plan on talking to our kids about our money. We want to share with them mistakes we made, things we learned along the way, and as they get older help them become active parts of our regular budget committee meetings. Stay consistent - I remember starting and stopping chores several times as I grew up. We would do well for a while and then things would get busy, we'd get bored, or we'd drive our parents so insane that they would give up. It's important to be disciplined and stick with it. Dave even talks about keeping a calendar so you can make sure you don't miss your weekly pay day. It's easy with our busy lives to forget a week. One week can lead in to two, and before you know it you've missed the teachable lessons with your kids. Let them make mistakes - We all want to protect out kids, but be very careful not to get overly involved in the management. Dave tells a great story of his daughter going to a carnival and blowing all her spending money on carnival games. Being as they are, she walked away with nothing to show for her time and money. We obviously know it was a mistake, but it's a lot more powerful lesson when they see it for themselves. Some thing else that stuck me about that story is his point on how little of an impact it would have on them if it was money you had just handed over to them. I can't think of how many times I blew threw my parents money on silly things like that. Mistakes are very important teachable moments. We all make them. Lead by example - I think the best lesson you can teach your kids is being a good example. They need to see you spend, save, give, and invest (again, why I see the value in breaking down the barriers and letting them be involved in the family finances). That old adage is definitely true - more is caught than taught. Keep this phrase fresh in your mind with every decision you make. Proverbs 22:6 says "Train a child in the way he should go, and when he is old he will not turn from it" (NIV). Dave says it in a way that I think will hit home with all of us, "Train them or they will move back in and live with you when they are 27." You can't argue with that! What lessons are you teaching your children? excellent point about the third leg of the stool - we teach to save, spend but yes often forget the GIVE part. Great post! I'm really enjoying this series. Such a helpful, thorough and well-written post on kids and money!! I so agree - especially on relating money to work and allowing them to make mistakes so that they can learn from them.